12x18 Chalkboard Effect Print. 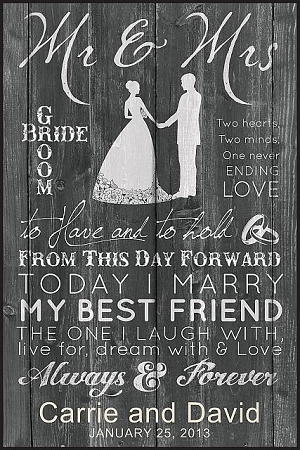 Bride groom, two hearts, two minds, one never ending love, to have and to hold from this day forward, to cherish as long as we both shall live, today I marry my best friend the one I laugh with, live for, dream with and love, I have found the one whom my soul loves, always and forever. Care: Clean with a damp cloth and wipe dry. This item is not intended for outdoor use and exposure to water may cause irreversible damage.